Former British Soldier To Be Prosecuted For 1972 'Bloody Sunday' Killings The veteran was charged with the murders of two people and the attempted murders of four others who participated in a peaceful civil rights protest in Northern Ireland. Families of victims of Bloody Sunday, in which 13 unarmed protesters were killed in 1972, marched before the prosecutor's announced charges against a former British paratrooper. A former British paratrooper has been charged with the killing of two unarmed protesters in Northern Ireland in 1972, in an incident that has become known as Bloody Sunday. The veteran, identified as Soldier F, will also face prosecution for the attempted murder of four others. He will face trial for the murders of James Wray and William McKinney, and the attempted murders of Joseph Friel, Michael Quinn, Joe Mahon and Patrick O'Donnell. A statement from the prosecutors announced that 18 other suspects, including 16 ex-soldiers and two alleged Official Irish Republican Army members, under investigation will not be charged. "[I]t has been concluded that the available evidence is insufficient to provide a reasonable prospect of conviction," the statement said. 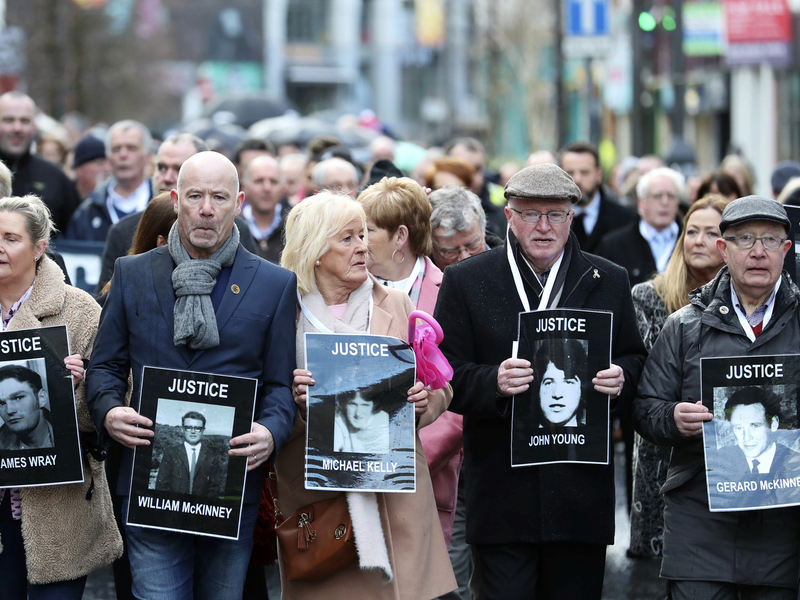 "It has been a long road for the families... and today will be another extremely difficult day for many of them," Northern Ireland's director of public prosecutions Stephen Herron said as he announced the charges. "We recognize the deep disappointment felt by many of those we met with today," he said. Despite the disappointment many victims' relatives expressed that other prosecutions would not be carried out, "Their victory is our victory," said John Kelly, whose 17-year-old brother, Michael, was killed that day. Britain's defense secretary Gavin Williamson drew condemnation from victims' families after issuing a statement that said that the Ministry of Defense would help defend the prosecuted veteran. "We will offer full legal and pastoral support to the individual affected by today's decision," Williamson said in a statement. "This includes funding all his legal costs and providing welfare support." Bloody Sunday refers to January 30, 1972, when British troops fired on unarmed civil rights protesters in Derry, or Londonderry, in Northern Ireland. It is among the most notorious incidents that took place at the height of Northern Ireland's civil unrest. The period became known as "the Troubles," which refers to the four-decade-long conflict between Roman Catholic Irish who supported a united Ireland, and the British along with Protestant Irish who wanted to remain a part of the United Kingdom. The violence that arose in those years killed more than 3,500 people. An initial internal military inquiry immediately following the shooting found that the soldiers were not at fault. But in 1998, more than 25 years later, then-Prime Minister Tony Blair opened a new inquiry into Bloody Sunday as victims' families placed increasing pressure to investigate their loved ones' deaths. What followed was a 12-year-long investigation involving more than 900 witnesses and hundreds of hours of evidence. Investigators concluded that the lethal force used by paratroopers that day was "unjustified." "We found no instances where it appeared to us that soldiers either were or might have been justified in firing," the published report stated. Northern Ireland Police Service then launched a murder investigation in 2012, which eventually led to the Public Prosecution Service's announcement today to prosecute one of the former paratroopers.